Thanks to Jessica Rodriquez over at Bubbalon! 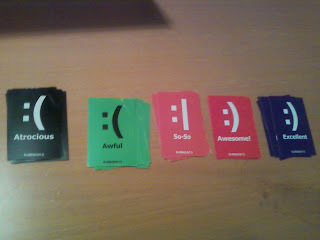 @jessrod354 sent me some Bubbalon stickers! Here is the cute letter she handwrote! Bubbalon's integration with FourSquare got a good work up by Da Man, Damond Nollan here. I've been toying with it slowly but surely. It might help if it WASN'T just an iPhone app right now, but I digress. Here's the group of each of the five Bubbalon stickers. Now I just need to find places for them. I'm not sure there is much in my life that is ATROCIOUS :( but I'll see what I can do. If you are interested in getting some, hit Jess up on Twitter at jessrod354 or at @bubbalon- I'd bet she would LOVE to send you some. 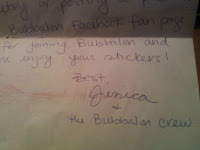 PS- Apparently Jess writes EVERYthing for Bubbalon, but if you love Etsy, so does she- see here!